Most Dexters are solid black. Red or dun colored are less common. Horns on cows are fine and curved forward. Bulls' horns are thick, solid, and slightly curved at the tips. Their distinctive heads are short and wide between the eyes, with straight sides. Dexter milking cows can produce more milk for its weight than any other breed. The daily yield averages 1 1/2 to 2 1/2 gallons with butterfat content of 4 to 5 percent. Sometimes they up to one quart cream per gallon. The cream can be skimmed for butter or ice cream. Dexter Beef Cattle mature in 18 months and result in small cuts of high-quality lean meat, graded choice, with little waste. The expectable average dress out is 50 to 60 percent and the beef is slightly darker red than that of other breeds. 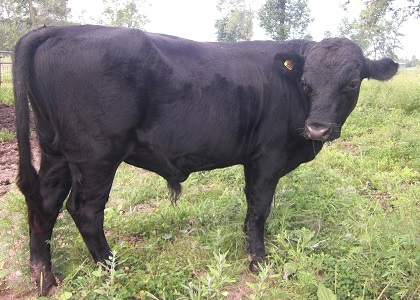 In recent years there has been a worldwide surge of interest in Dexter cattle. They are gentle, hardy and easy-to-handle animals and one of the world's smallest bovines. They require less pasture and feed than other breeds. They thrive in hot as well as cold climates and do well outdoors year round, needing only a windbreak, shelter and fresh water. Fertility is high and calves are dropped in the field without difficulty. They are dual purpose, being raised for both milk and meat.